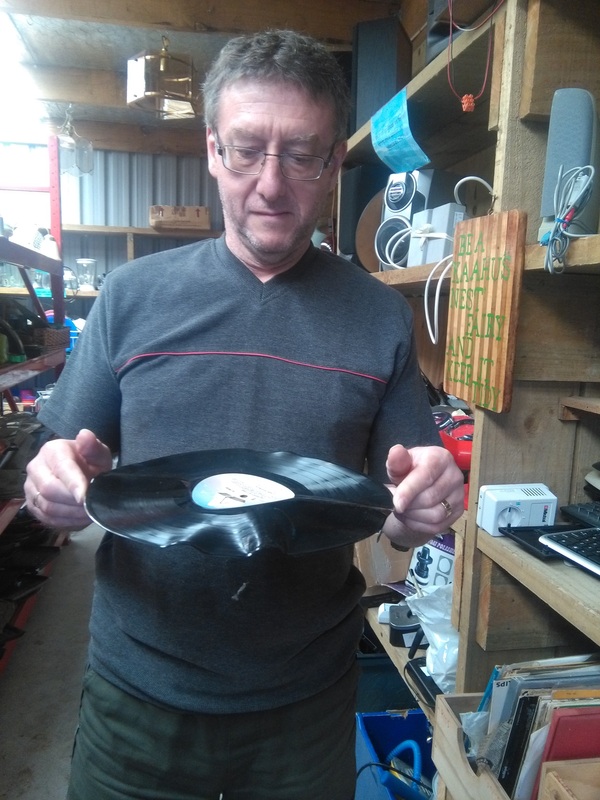 DR RICHARD VAREY reports on his long and vigorous examination of a miscellany of record cleaning devices and methodologies. 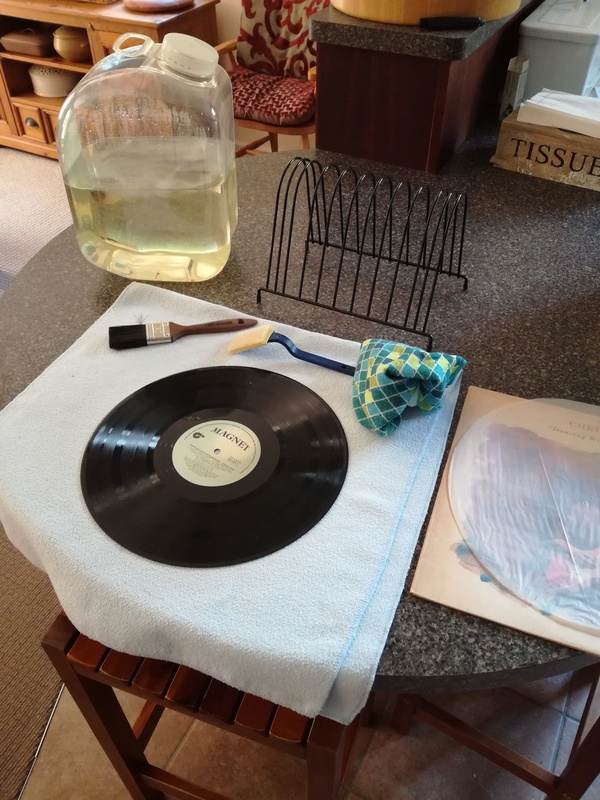 The effects of deep cleaning a record extend well beyond removing muck that will foul the stylus and interfere with pickup of the information from the grooves, and those ever-familiar clicks and pops. The soundstaging from a properly cleaned record is more dynamic, so the music sounds ‘louder’, as if the stylus has more freedom tracking the groove. More high frequency information is extracted, which sharpens ‘leading edges’, everything is snappier, faster, tauter, including bass frequencies. These effects give rise to more ‘ambience’ – there is more ‘air’ and ‘sustain’ to musical notes. The cartridge often seems to track better, and dynamic peaks seem to be ‘easier’, more ‘open’, have more freedom, with less strain. Overall, everything sounds more ‘live’, more ‘you are there’, more ‘in the room’, more present. But what to use to get the best results? For a long time I used an Orbitrac record cleaning kit (I still have it, now with a piece of soft microfibre cloth substituted for the heavily soiled pad). While the records cleaned always looked shiny and the visible deposits were removed from the surface, it didn’t really occur to me that some of the dirt was probably being pushed down into the grooves. I never felt fully satisfied with the results of cleaning, and since then, I’ve used quite a few record cleaning methods and products to try to get all dirt off the disc without damage, so thought it would be useful to bring together a summary of my findings. I’ve gone back over several years to describe a range of materials and equipment I’ve used, the method, and my underlying thinking about the approach to the task of accomplishing the best listening experience from playing records. I’m not claiming any justification other than my subjective experience as a long-time record collector and music fan. I’ve devoted many hours to cleaning records. This is the simplest method, requiring manual rubbing of the disc each side first with distilled water and isopropyl alcohol, or with a safe plant-based dishwashing liquid (no colouring or frothing additives), applied with a decorator’s paint pad or brush, then rinsed with distilled water, and lightly buffed dry with another microfibre cloth. The GEM Dandy is a simple apparatus for using the power of a water jet to flush dirt out of the grooves. I reviewed this product at http://www.tnt-audio.com/accessories/record_rejuvenator_e.html. Here I’m only considering the washing method and not the disc rejuvenation and preservation product. The Gold Note Kymyas disc cleaning and surface treatment fluids were reviewed at http://www.tnt-audio.com/sorgenti/goldnote_vasari_e.html. Here I’m only considering the cleaning fluid. I also use a Mobilgraf BRC-01 ultrasonic bath (see http://audiorevita.pl/) for deep cleaning. The principle is well-known for cleaning small objects (medical instruments, spectacles, jewelry, etc). Cavitation bubbles are produced in the solvent (which may be distilled water, with or without a chemical-free dishwash detergent – there’s no need to use isopropyl alcohol) by the high frequency pressure waves created by the transducer. 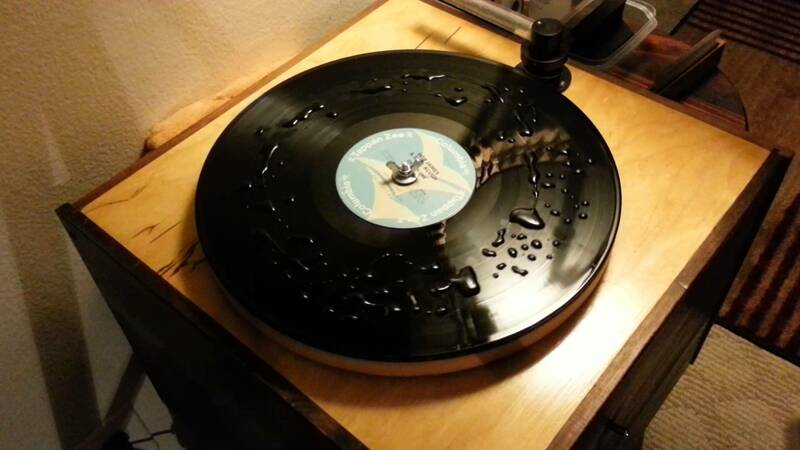 This agitation removes tiny particles of contamination from the surface of the record. There’s a demonstration video on the website. 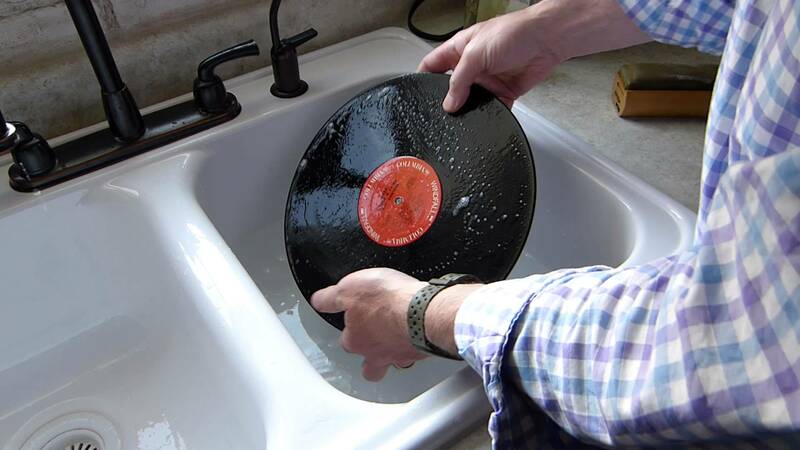 Having tried many commercial products and DIY concoctions, with varying degree of effectiveness, and still not satisfied that I have a dependable means to clean really dirty records recovered in crate digging expeditions, I was struck by the possibility that ultrasonic cleaning could be a practical and good-value option. I have seen quite a few commercial cleaning machines, and they all seem either over-engineered or over-priced, and usually both. This unit (from Poland), developed from a DIY design using low-cost readily-available DIY parts, seemed like a viable and inexpensive ultrasonic cleaner. The stainless steel bath is mounted in a lightweight plastic box with carrying handles, and a switched simple synchronous motor runs at just under three complete rotations per minute. 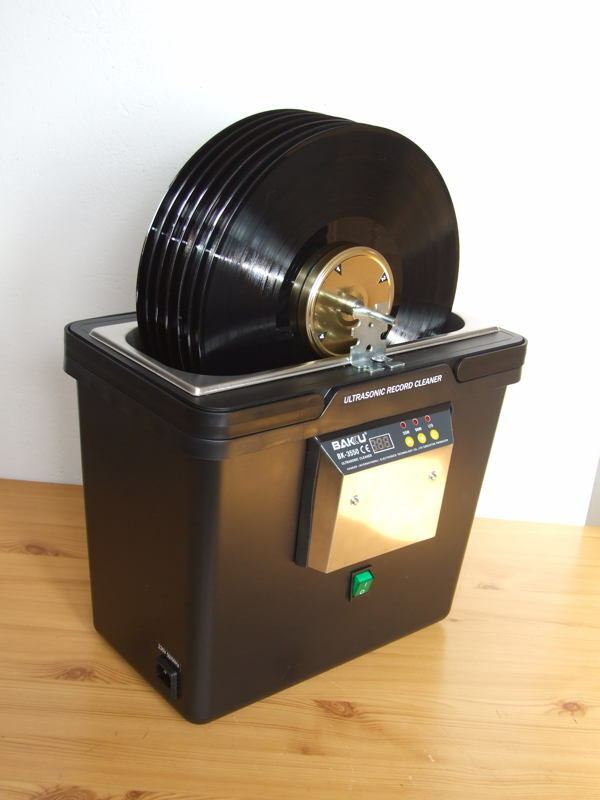 The tank can hold up to seven LP records mounted and spaced on a steel spindle, and there’s a choice of 35W and 50W ultrasonic operation in 180 and 240 second runs. The bath is simply emptied of dirty solvent with a length of plastic tubing. In use, it’s a bit noisy – although no more than I expected for a transducer vibrating a metal bath in a plastic housing – but it’s very effective. The dirt falls to the bottom of the bath and is easily wiped away with a paper towel. I run it over two rotation cycles, then rinse each disc and dry with a cotton cloth and microfibre cloth. I then leave the records on my drying rack for a while to ensure labels are truly dry, before re-sleeving with pristine new anti-static inner sleeves. I get excellent results – no clicks and pops from dirt and surface residue – but this doesn’t fix physical wear and tear, which can be revealed when the disc is really clean. Many of my records are rescued discs up to 60 years old, and they sound great without the interference. I’ve reviewed my experience with these methods over the past few years to see if I can identify the most worthwhile method. By effect I mean how clean does the record become. ‘Effort’ is an assessment of time and labour involved, while ‘tidiness’ is shorthand for convenience in terms of preparation (including setup, which is significant for many records to clean, as well as for just a single disc), tidy up, and mess (washing cloths, setting up and storing equipment, drying wet surfaces, noise, etc). ‘Cost’ covers the apparatus and consumables such as cloths, water and cleaning solution. ‘Chemicals’ covers any inclusion of potentially harmful additives that might affect record condition in the short or long term. I’ve simply ranked the methods relative to each other on each criterion. I’ve scored each out of ten, and weighted these criteria to show my preference in record cleaning. 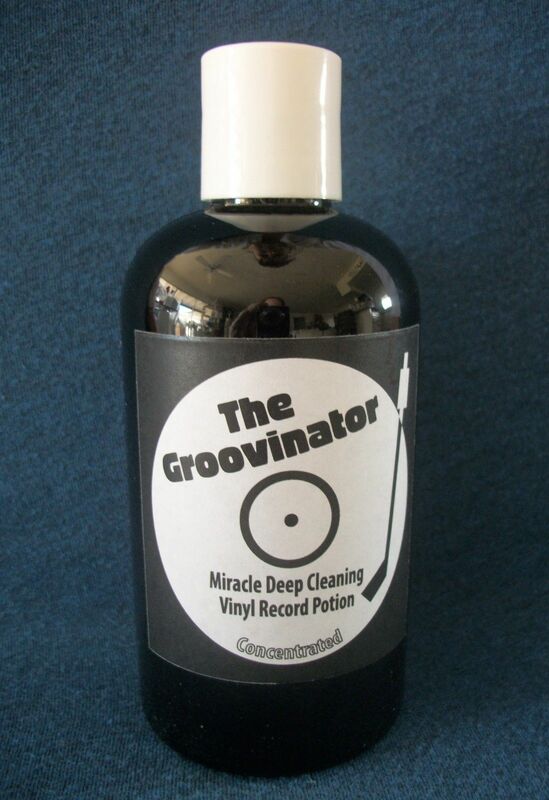 2nd – The Groovinator – it just works! What I’ve learned over years of experimenting, is that method and technique are far more important for cleaning effectiveness than a magical solution (usually with an eye-watering price). A simple, low-mess method can be highly effective, and especially if care is taken to diligently rinse and dry the discs. I’ve also learned that cleaning records isn’t only about avoiding irritating clicks and pops, but also about accessing the richness and texture of the music pressed into the grooves, and about prolonging the life of the pickup stylus and the discs. I’ve found that a simple, non-damaging, low-cost method can have a profound effect on listening pleasure and the preservation of expensive records and styli. Which is my preferred cleaning method? The simplest and quickest that works! So, a manual wash with distilled water and The Groovinator, a rinse, and buff dry. Other options? Yes, lots. Too many. Easy to spend money on mysterious solutions and gadgets, but really not necessary if you take care and don’t use abrasion or harmful solvents. I have decided to not use isopropyl alcohol.